Even mainstream media like the New York Times and The Economist have recently posed the question: Why don't the poor rise up?, uneasily amazed that capitalism hasn't met with greater resistance. 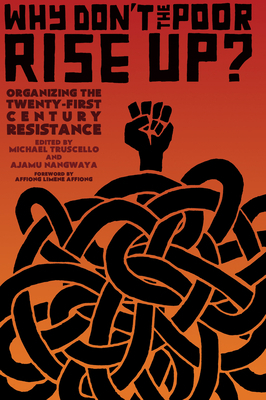 In the context of unparalleled global wealth disparity, ecological catastrophe, and myriad forms of structural oppression, this vibrant collection offers a reassessment of contemporary obstacles to mass mobilization, as well as examples from around the world of poor people overcoming those obstacles in inspiring and instructive new ways. With contributions from Idle No More organizer Alex Wilson, noted Italian theorist Franco "Bifo" Berardi, and nineteen other scholars and activists from around the world, Why Don't the Poor Rise Up? presents a truly global range of perspectives that explore the question of revolution, its objective and subjective prerequisites, and its increasing likelihood in our time. Ajamu Nangwaya, Ph.D., is an educator at Seneca College. Ajamu has over 25 years of experience in community organizing and advocacy. He is a former VicePresident of CUPE Ontario, held leadership position in CUPE Local 3907, former member in CUPE Local 3902 and served as a VicePresident of CUPE Toronto District Council. He is currently an organizer with the Network for the Elimination of Police Violence. He is a columnist with Share newspaper. His writings have appeared in publications such as the Toronto Star, CounterPunch, Dissident Voice, Huffington Post, Rabble.ca, Pride newspaper, and Briarpatch magazine, the Black Agenda Report, Truthout, NOW Magazine and Pambazuka News. Michael Truscello, Ph.D., is an Associate Professor in English and General Education at Mount Royal University in Calgary, Alberta, Canada. His academic interests include anarchism, the politics and poetics of infrastructure, petroculture, media studies, and technology studies. In 2013, he coedited a special issue of Anarchist Studies on "anarchism and technology" with Uri Gordon. In 2011, he produced the documentary film Capitalism Is The Crisis: Radical Politics in the Age of Austerity . He is the author of The Infrastructure Society (MIT Press, forthcoming).